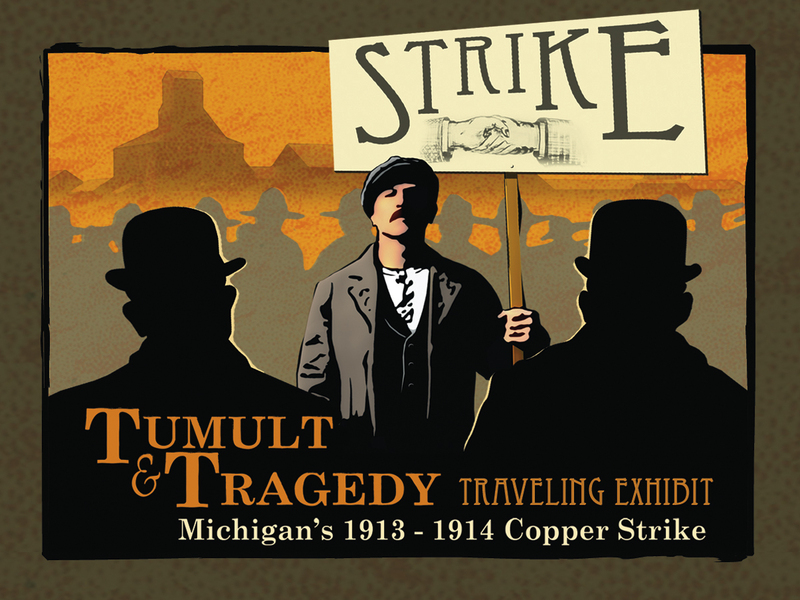 Original artwork by graphic designer Mike Stockwell for "Tumult and Tragedy" a traveling exhibit on the 1913-14 Michigan Copper Strike. On November 1. at 6.30 pm, Michigan Tech's Copper Country Historical Archive is premiering a traveling exhibit titled "Tumult and Tragedy" on the first floor of the JR Van Pelt Library. I (Gary) had the great and very fortunate opportunity to be the Project Historian for this traveling exhibit. I can truly say it was a pleasure working with Project Manager Erik Nordberg and Project Designer Mike Stockwell of Cranking Graphics. I really think we have put together a comprehensive look at the strike that includes not only information and interpretation about the actual strike, but also events that preceded the strike and consequences of the strike. In this traveling exhibit, we included primary quotations from historical actors, text, historic photos, drawings, and maps to give the most well-rounded portrayal of the great complexity of the strike and the people who lived through it. The traveling exhibit will move throughout the Copper Country and at each new exhibit installation there will be a featured speaker presenting on an aspect of the strike's history associated with the exhibit's content. For more information on the exhibit, the exhibit opening on November 1, and the presentations take a look at the Archive's blog: http://blogs.mtu.edu/archives/2012/10/26/archives-premiers-new-exhibit-about-1913-strike/.